“Kiss ko pyaar karoon, kaise pyaar karoon, tu bhi hai, yeh bhi hai, woh bhi hai…hai! 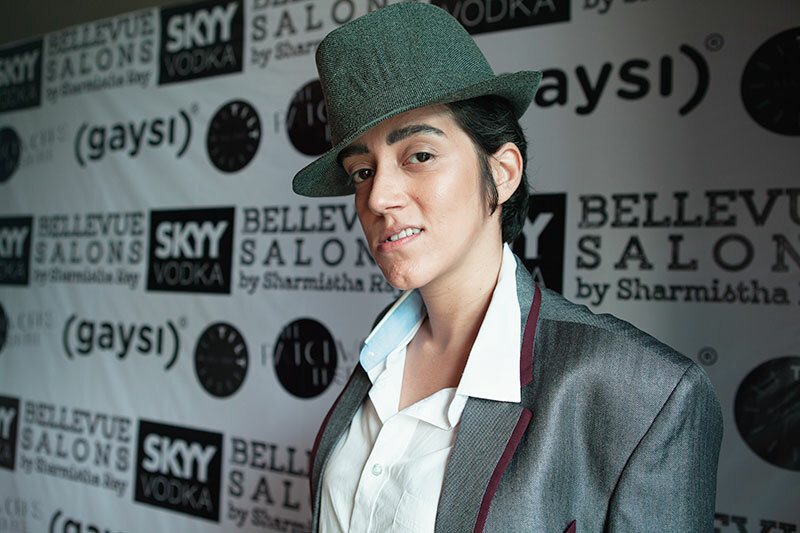 A gold sequinned Shammi Kapoor lookalike burst on the stage with a bang and thus began Tape — India’s first drag king show. Funny, poignant, cool and, above all, celebratory, this was fierce and unapologetic theatre, written and directed by Vikram Phukan, and produced as a joint effort of the Patchwork Ensemble theatre group, the Gaysi Family community organisation and artist Sharmistha Ray’s Bellevue Salons. Structured as a play within a play and set in a fantasy Mumbai where drag king performances are the norm, Tape had Puja Sarup channelling Shammi Kapoor and Sheena Khalid as Justin Timberlake, with a supporting cast of other fantastic characters like a raunchy Mr 55 (Ratnabali), and the crowd favourite, Harpal Singh (Mukti Mohan). We’ve had drag in India forever — whether in our mythological stories, in folk traditions, or even in Bollywood, but it’s mostly been men dressed up as women and not the other way round. Women performing masculinity — overtly and flamboyantly — have been rather invisible. Tape was an attempt to address this imbalance. The title refers to something that many, but not all, drag kings do before they get on stage — they tape their breasts to flatten them. 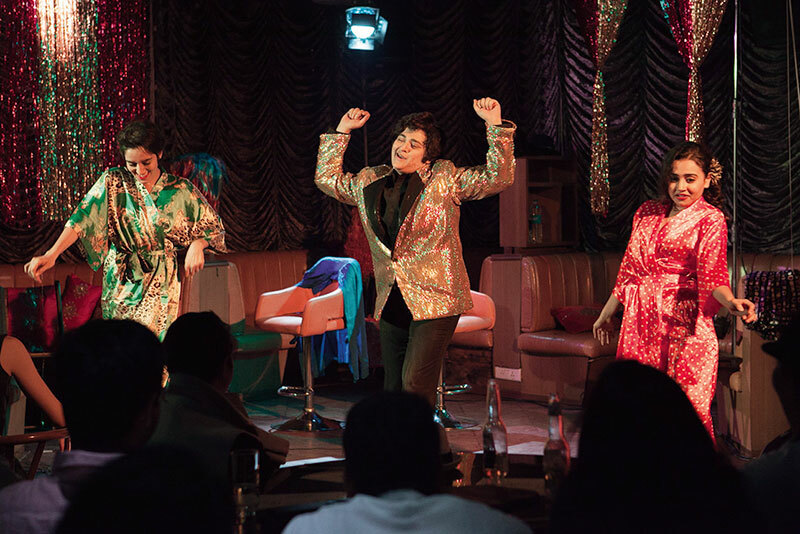 The play dealt with this activity — an act of personal politics — as it did with many other aspects of gender, societal expectations, conformity and performativity, but it did so with such a light and fabulous touch that it never felt heavy or preachy. I just couldn’t stop smiling, non-stop. In any case, I was in a really good mood after having attended Lakmé Fashion Week. Just like with Tape, here too questions about gender, beauty and performativity had been raised. What! You must be wondering — a fashion week questioning ideas of beauty? Isn’t a fashion week all about reinforcing stereotypes? Well, not this one for sure! Consider Eina Ahluwalia’s conceptual jewellery installation titled Pilgrimage. 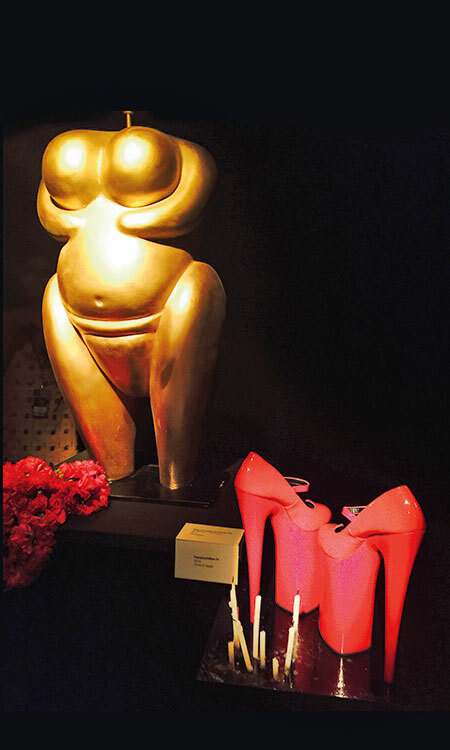 The first part of the installation comprised a walk-through in between gold statues of big-bodied Venus figures, inspired from ancient times. At the base of each figure, Eina had piled up an array of objects — ranging from hair removal creams, tweezers, razors, make-up, ridiculously high heels, candles and flowers. Each arrangement was both — a shrine to an alternative idea of beauty as well as a scathing commentary on conformist beauty ideals in today’s world. The second part of the installation had people walk past 12 seated models wearing Eina Ahluwalia jewellery. As I passed them, they began to look at me from top to bottom and whisper comments to each other about my appearance. It wasn’t a very pleasant feeling, I must say, even though I’m quite used to people checking me out by now. The third part of the installation comprised a line of hanging mirrors with words like ‘beauty filters’ painted on them. The irony of posing in front of these and uploading images to Instagram was evident, but the urge was too compelling not to. Finally, as the last part of the exhibit, I wore headphones and lip synced to the mythological Sirena whisper ‘You are perfect’ that played in different modulated voices even as I viewed a digital screen with different versions of Eina’s photoshopped face. By the time I walked out through the exit, I had tears in my eyes. There can never be one fixed idea of what is beautiful, and instead of chasing ever-transient, impossible ideals, we need to find a comfortable acceptance of our own perfection, Eina told us with a big smile outside, and I couldn’t agree more. Eina’s installation actually reminded me very much of artist Vidha Saumya’s work, currently on display at Mumbai’s Galerie Mirchandani + Steinruecke. 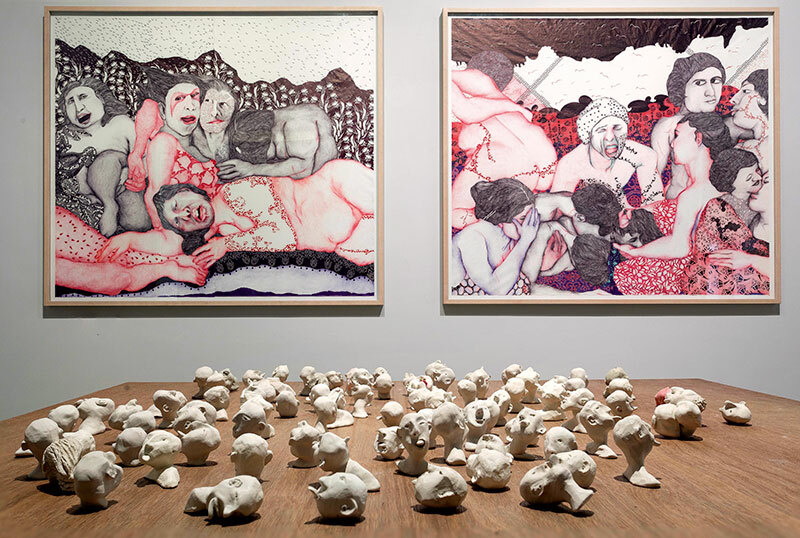 Vidha’s 2011 Love Charades at the same gallery featured spotlit corpulent women laughing while contorting their bodies within circus rings. Later for the Touched by Bhupen tribute there, she created large-faced women, with names of recent hurricanes, sneezing passionately. Now as part of the Body as Site exhibition, Vidha’s women create mesmerising Messes of the Afternoon. The title refers to an experimental home-made film Meshes of the Afternoon (from 1943) which combined the surreal and mundane wonderfully. Vidha’s works are very much a combination of both these elements. In this series of seven large-format drawings, again done entirely with Cello pens in her signature style, there is more fluidity, more in-between-ness. The big-bodied women sometimes flow into big-bodied men, and in many cases, we can’t tell who is what, but it doesn’t matter. Each act in Vidha’s work — whether of feeding, whispering or embracing — is, both, intensely private and extremely public and by viewing these gender-fluid bodies on an imaginary still afternoon, we are forced to confront our own internalised notions of beauty, and indeed, patriarchy and societal norms. Switching back to fashion, while Eina’s installation was the highpoint of my LFW experience, there were other moments that stood out too. I must doff my hat yet again to the subversive trio of Saket Dhankar and Gautam Vazirani from IMG and Purnima Lamba from Lakmé for curating a provocative fashion week of ideas. 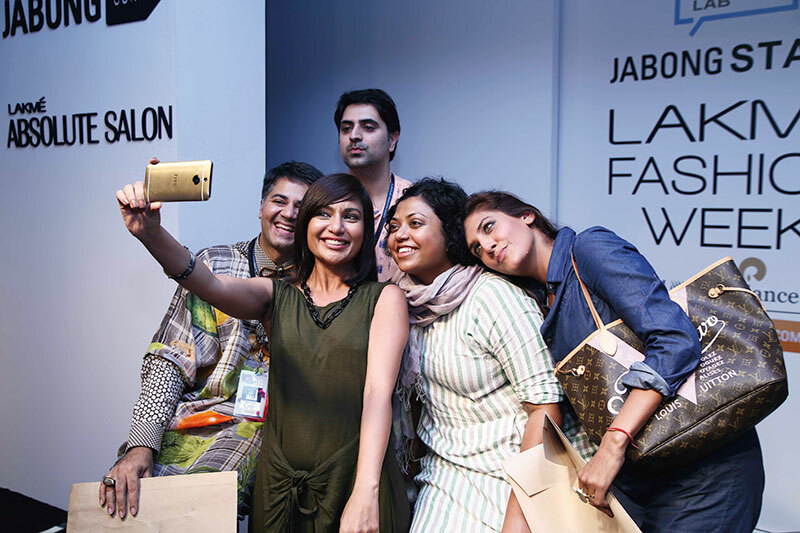 Many of these innovative events happened on the Jabong Stage — located a floor below the Main Show Area at The St. Regis Mumbai, and aptly so — the flow of ideas from the margins into the mainstream is often subterranean till it bursts into the open. Kallol Datta and Ruchika Sachdeva (Bodice) organised really compelling meditative performance-installations at the Jabong Stage. Ragini Ahuja took over the LFW apartment on a higher floor for an Ikai installation over cupcakes and conversation. I also loved walking over with the fashion frat to the PVR Cinemas outside the St. Regis Hotel for the Fashion Film outing. Hot buttered popcorn and a vastly improved creative body of work from our designers — this is another hit idea nurtured season after season that has finally begun to bloom. Actually, the geographical net widened even further this LFW season — so it wasn’t only about crossing mall roads in Parel. 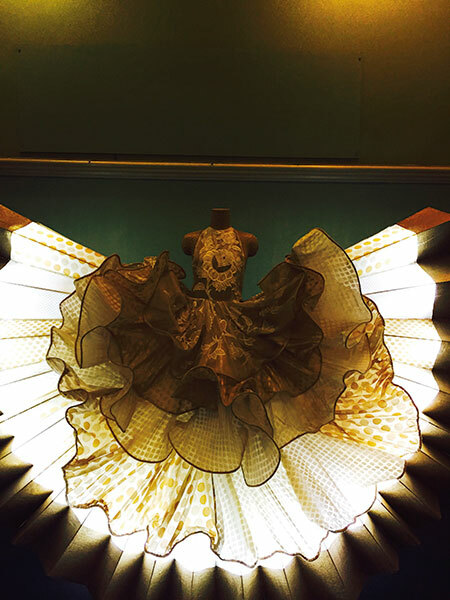 Besides the offsite shows at Bandra’s Mehboob Studios, including the grand Gaurav Gupta finale, the organisers boldly returned to Byculla’s Dr. Bhau Daji Lad Museum after last season’s fiasco. This time — the ambitious collaboration between politician-designer Shaina NC and the Ministry of Textiles — Woven Wonders of Varanasi — went off without a hitch. The exhibition brought together some of our country’s most talented weavers and fashion designers together as a tribute to the Varanasi textile industry. I loved everything, but the Ritu Kumar display, especially, stood out, as did her gesture of having her team of master weavers from Varanasi walk the ramp for her as her showstoppers at her celebratory show some days later. It wasn’t only about spreading the net wide this LFW; it was about digging deep too. As you know, dear readers, each season I curate a LFW panel discussion and the tradition continued this time as well. My chat between fashion media professionals Aishwarya Subramanyam, Ambika Anand and Malini Agarwal spanned print and digital media as well as TV. The room was absolutely crowded. The conversation flowed fast and furious. Paid content, the lack of suitable training for the fashion students, the value of being able to ‘shapeshift’ and flow across media, how we can create better fashion journalists for the future — we explored all this and much more with a deeply appreciative, participatory audience. Ecosystem-building was also a key focus of another panel that Powder Room author Shefalee Vasudev had put together on Textile Day with designer Sanjay Garg, Alok Kumar, the Development Commissioner of Handlooms from the Ministry of Textiles, and Ashoke Chatterjee, the former Executive Director of the National Institute of Design. The feisty talk had analogies galore. Rohit Bal, present in the audience, compared traditional textiles to a bullock cart and modernity to a Tata Nano. Ritu Kumar, also present, said that no, actually traditional textiles were like an old monument while modern garments were like a new building. Sanjay Garg, chipped in from the panel: actually, our textile traditions are like an old radio which has stopped working! There was much laughter all around. But while the mood was light, the numbers were sobering. As Alok Kumar pointed out, there were 43 lakh weavers in our country as per the last census and maybe the number has come down to 35 lakhs today. Seven hundred crore square metres of textiles are being woven in India each year, which is significant. However, our weavers are aspirational and one has to turn weaving into a profession that they can aspire to. He honestly added that the government, which spends 400 crores of rupees each year on textiles, has certain limitations and needs to close the critical gap which other stakeholders can’t fill. They’ve identified branding as one such gap, to win trust of consumers, and the second is, according to Kumar, how to develop a supply chain of hand-loom weavers — so that weaving continues as a profession. I was thrilled to see a large student presence at both talks. Perhaps not as much as in the smoking and party zones near the main stage area, but enough to ensure that in this Lakmé Fashion Week of ideas, something will be carried forward to the next generation of fashionistas.